Brownie's has taken another leap in technology with the introduction of Robin Subaru engines for all gas-powered and commercial third lung hookah systems. Based on the Subaru WRX World Rally champion car's boxer engine, the EX series is designed for extraordinary power, durabily and efficiency. * Fewer parts, grater efficiency! 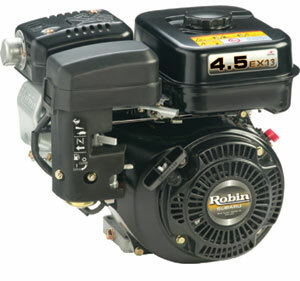 The Robin Subaru EX series is the first air-cooled engine line to use advanced Chain Driven Overhead Cam (OHC) technology. This more advance design greatly reduces the number of parts (and is more efficient) than the push rod design of other manufacturers. * Much easier to start! 30 to 40% less pulling force required than the comparable sized Honda GX models. * Significantly quieter! Superior muffler design allows you to enjoy your dive without disturbing others. * Lower emissions! The higher efficiency of the OHC technology translates to less unburned fuel emitted by the engine. Easily meets EPA Phase 2 and CARB Tier II emission standards. * Runs 20ºF cooler! 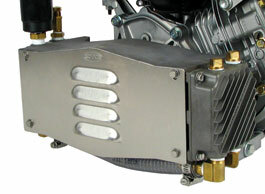 Internal and external cooling fins in the case and head assembly more efficiently disperse heat, preserving oil viscosity and extending engine life. * Bauer Certified technicians come to your boat or yacht for service and has Authorized Service Centers for all Brownie's Third Lung products.